Nagai Go created a hit with his Mazinger Z in the early 1970s, and this pushed the world of animé in a new direction  giant robots. Toy manufacturers then began making toys based on these mechanical creatures. Rather than depending on manga for inspiration, the new animé were inspiring spin-offs of their own. Science fiction thrillers with giant, fighting robots were churned out one after the other in the mid-1970s, the most notable being Space Cruiser Yamato, which spawned an animé generation. This film, so closely followed by teenagers, launched another science fiction boom, opened the door to the publication of animé magazines, and attracted the attention of older people, as well. One science fiction blockbuster riding this trend was Mobile Suit Gundam. Animé began portraying teenagers and young adults 10 years after manga had done so, introducing complicated stories, youthful emotions, and philosophical themes. Animé such as Legendary Giant God Ideon, Botomusu, and Daguramu, all from the Gundam series, continued to focus on this age group into the 1980s. But the golden age of youth-oriented works that were not inspired by manga ended soon after 1980, and once again popular manga formed the basis for animated blockbusters. These included Those Obnoxious Aliens, Touch, and Kimagure Orange Road. Another big hit, Dr. Slump, forced animators to take a second look at manga. The manga-based trend was seen again in Doraemon, a feature animated film released in 1980. Some stories in Shonen Jump, a very popular comic magazine even then, became animé hits. Three of these were Captain Tsubasa, Knights of the Zodiac, and Muscleman. On the other hand, films like Otomo Katsuhiro's Akira sprang from a new style of manga. Then, in the mid-1980s, both manga and animé took on new forms, helping them broaden their audience base by including other age groups. The various possibilities being explored within this pop culture attracted children, teenage boys and girls, and even adults. Manga, which had inspired animé in the first place, began diversifying even further and underwent various transformations in style. 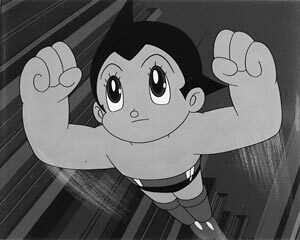 Most non-Japanese animated films were wholesome and suitable for children  especially those made by Disney  or else they were experimental art. On the other hand, Japanese animated films presented storylines suitable for teenagers and young adults, attracting a different type of audience. Japanese animated dramas shied away from uplifting themes leading to moral or poetic justice. Instead, they encouraged their audience to discover new possibilities and be swept up in some magic spell. High-quality works, like those of Otomo Katsuhiro and Shiro Masamune, became accepted as cyberpunk art. Miyazaki Hayao, who had already made waves with Lupin III: The Castle of Cagliostro, was one animator who brought animé to the level of a cult with his Nausica of the Valley of Wind. Oshii Mamoru was another who achieved the same result with his Those Obnoxious Aliens 2: Beautiful Dreamer. As a result, the viewing public began seeing animators as celebrities. The entertainment and artistic aspects of animé began attracting serious attention in the 1990s. In Japan, one direction taken was a focus on mature themes. These animé were difficult to export. The sexual overtones and violent scenes were considered unsuitable for audiences in countries where animated films were made for children. Some works were edited, with objectionable scenes cut so they could be broadcast in countries where strict criteria were enforced. Many others were seen only in Japan. Even today, the animé-for-teenagers model is still not fully understood overseas, and films that fit this model are viewed only by enthusiasts. Animé offer many possibilities, because they speak in an international language and express a story in a way understood universally. Many works have not yet been exported, but they are waiting to get out there. Animé have evolved to a high level because anything can happen in them, and everything can be expressed freely. They introduce fascinating characters, complex inner workings, and stories with deep meaning, all combined with rapid action, expressive power and exceptional visual effects. These superlative aspects explain why they are so popular in Japan. But continued success can only come if they can keep satisfying the fans, who always want to experience new and more exciting possibilities.